19 Fabulous Reasons to accessorise!! If I had a mantra in life it would be..when in doubt, accessorise!! Either that or ‘never let a day go without eating chocolate’….Or ‘Donuts are Amazing and Necessary’. But I digress. Accessories are my happy place. They dress up your outfit, give you abit of personality and pizzazz, and they’re just so fun! And when they’re sparkly, colourful, unique and funky, there’s just no way you can go wrong. I’m just assuming some of you are as obsessed with finding the perfect accessory as I am….so I’ve done a round-up of my favourite earring and accessory makers on Instagram right now. While it was so tempting to keep adding to this list, I had to stop before it turned into an encyclopaedia!! 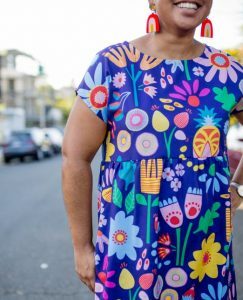 There are SO MANY amazing designers and makers out there just waiting to complete your outfit and amp up your style…and Instagram is one of the best places to find them! So without further ado, here’s my list of incredible accessory designers and makers that you’ve gotta check out. Instagram and Shop links are included because I’m nothing if not a shopping enabler. You can than me later! Colourful, unique and aall round RAD, there’s something for everyone in this epic list! So I actually own more Kenzie Collective bling than I can count….with more on my wishlist – this babe knows how to creat colourful, fun and funky accessories to rock your style – and keep you coming back for more! A perfect combination of sophisticated glitz and glamour and colourful, quirky fun (Well, that’s what I think anyway)! Kristen Devitt is the grand master of statement ear bling! Big, colourful and vibrant, this new designer on the scene knows how to make an ear statement. I LOVE my rainbow ghosts from Meg Makes, and I get comments on them everywhere I go! Sooo much gorgeous -I love the outside the box GLAM designs from this babe – from funky 3D printed jewellery to gorgeous resin! Colourful statement earrings with a good dose of light hearted fun – crushing on the fairy bread dangles!!! Oversized, fun and quirky – have you seen the squidtopia dangles available through Kenzie Collective?! The rad factor is out of the park here! OH! Just loving the art series – dreamy splashes of vibrant colour, like watercolour dripped in water – Beautiful! I’m in love with the beautifully marbled colours in intriguing and original shapes – the green especially! This label is something special. It’s like wearing stunning, colourful miniature sculptures on your loves. Each piece tells a story and I’m completely in love. On the wish list for sure! Oooh these are like wearable abstract art pieces,I love the colours, shapes and basically everything about this label. Bright, pops of pastel and neon colours – heaven! I’m crushing on the gorgeous tone of yellow in her resin bracelets and rings right now! It’s like wearing sunshine!! I love these unique designs – a touch of Art Deco, vibrant lush colour, these pieces defy categorising, but they are FABULOUS! Make a statement with original button jewellery – I especially love the bling, I have the disco hot pink ones! These gold button pendant and earring sets to die for! Unique, handpainted, in a mix of mediums, I love how so many of these pieces look like a little artwork! Quirky earring names and seriously fab colours and shapes, these babes know how to spoil your lobes with fabulous statement pieces. Love my Ingo bling! I was smitten as soon as I saw the pavlova and prawn dangles – eeeeek! A party for your ears! What can I say? Gorgeous sparkly pieces with plenty of quirk and fun – plus this babe makes a broccoli brooch that’s a perfect match for my gear! I love love love the quirky miniature artworks disguised as ear candy that this gal creates. I have bunches of bananas Fromm her…and I seriously want more Done by Daisy creations!! And there you go, quicker than you can say ‘where’s my credit card?’ , you’ve got a list of new stores to explore and love, and the potential for a whoooole lotta fabulous accessorising! I’d love to hear what you think! Do you love these stores too? And do you have faves I haven’t discovered yet?Let me know in the comments below!